Its ‘Makar Sankranti’ tommorrow. It is an auspicious day when the sun enters into the zodiac Capricon. The day is widely celebrated all over Maharashtra, parts of western, north and some parts in south India. In Maharashtra, delicacy called ’tilgul’ made out of til – white sesame seeds and gul – jaggery and people share this sweet with each other exchanging these words “Tilgul ghya goad goad bola’ which means have this tilgul and exchange sweet words. Another delicacy that is prepared is ‘gulpoli’ again made out of gul, til and few other ingredients stuffed and rolled like poli/paratha. Since my childhood days, I remember ‘aayi’ my mother prepared lots of ’tilgul’ and I used to distribute them amongst all my friends, we used to compete as to who gets more tilgul. In a non-stick kadhai or pan, add til and roast them on low flam until slightly golden. Remove. In the same kadhai roast coconut and peanuts separately until light brown. Remove and set aside. To the same kadhai add gul and cook stirring until it melts. Then add ghee to it and cook stirring until it begins to turn reddish. To that add til, coconut, nuts and elaichi, mix immediately and thouroughly as the mixture thickens very quickly. When properly mixed, remove from flame. You will have to prepare these laddus while the mixture is hot. 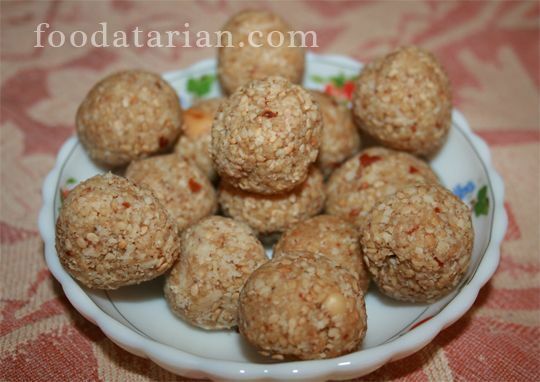 Grease your palms and fingers with ghee, scoop out a spoonful of mixture and roll laddus, firmly and quickly. When they cool down, store in an airtight container. Happy Makar Sankranti! Thanks Minal, Mi nakki aaj ghari try karna aahe hi receipe. Thanks Samira…wish you a very happy sankranti too!